The 2013 men’s fashion magazines and web sites are all in sync that colorful men’s pants are a hot fashion this year. Bugatchi Uomo offers a variety of colorful jeans and pants this season. The 5 pocket jeans offer soft comfort in solid color, fashionable Ruby red, cactus green, steel blue, grey stone, and taupe. Dress up with over a hundred different cotton fashion shirts with contrast cuffs, or go casual with a basic Bugatchi t-shirt. CEOgolfshop specializes in volume orders for active lifestyle apparel and executive gifts. While most companies carry only a few colors, CEOgolfshop offers the entire line of each brand, so when a customer falls in love with a brand, they have the most choices. CEOgolfshop.com is an authorized online retailer for the entire Bugatchi Uomo line. The privately held company currently sells throughout North America and seven countries, either directly or through its affiliates to retail buyers, resort buyer, executives, tournament directors, marketing directors, and consumers. A large resort contacted us looking for a very soft polo shirt that they could add their logo to. They wanted employees to wear and to be able to sell in one of the on premise retail shop. They wanted a shirt so soft you’d like to sleep in it because you wouldn’t want to take it off. Since our specialty is luxury men’s apparel with optional logo embroidery, I knew we’d have something suitable as other hotel managers across the country have requested our shirts too. One touch and their sold that it’s what they want to wear and what their customers want too. The 2013 apparel season has continued a trend in reduced availabilty of 100% cotton shirts. In 2011 cotton prices soared 50%, driving manufacturers to explore other fabric options, including cotton blends. Prices tumbled the following year, however, they’re back on the rise again. All of this has contributed to many manufacturers completely discontinuing their mercerized cotton shirts. The new 2013 Bugatchi men’s pima cotton short sleeve polo shirt. The ribbed “1643” polo, one of our best sellers for many years. 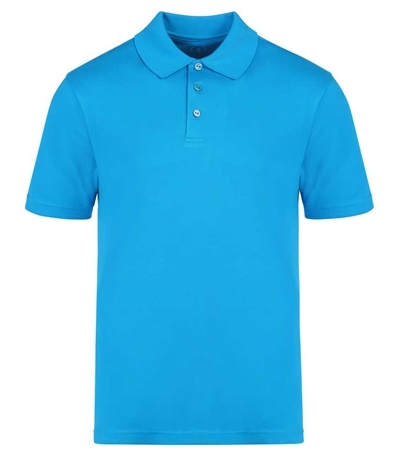 This ocean blue short sleeve polo shirt is made of a modal rayon blend with a rib texture. Over and over again, our customers tell us this fabric is their favorite. I recommend embroidery in matching colors, usually on the left sleeve for this shirt. The “1000” smooth modal rayon blend short sleeve polo shirt is shown in color coral. This is also a 65% modal rayon, 35% polyester blend as the ribbed shirt. I recommend embroidery in matching colors or multi-color, depending on whether the wearer will want to proudly wear the logo. Choose left chest or left sleeve embroidery, depending on how subtle the need is. The winner is: The “1000” smooth modal rayon blend, short sleeve men’s polo shirt. The smooth fabric exemplifies what the Bugatchi Uomo brand is all about. Accent inside collar, underneath collar, and placket for fashion forward dress. The versatile shirt is suitable on the golf course, under a sport coat, and casual over a man’s favorite pants. Dry clean or Machine washable. Embroidery: .DST and jpeg files accepted. Please provide PMS logo colors. Individually folded and wrapped in clear poly bag with retail tag on. Wholesale to trade and quantity discounts for corporate promotional apparel available. 4-6 month advance order is recommended to ensure best color and size selections. Also available in crew neck. Long sleeve is available seasonally. Accent (pattern) changes seasonally.